Breakfast of Champions – What the Hell Does a Gluten-Free Vegan EAT? What the Hell Does a Gluten-Free Vegan EAT? It's more than just lettuce. Slight backstory: when I was diagnosed with Celiac disease about five years ago, my mother was supportive, learned about gluten and living a gluten-free lifestyle, and outdid herself in her production of gluten-free confections. When I told her, much more recently, that I was planning to go vegan as well as gluten-free, she gestured towards her lush Michigan lawn and said “There’s what you can eat. Have at it.” i exaggerate, of course; my mother, after some initial misgivings, is now one of the most creative gluten-free vegan cooks I know. But her initial words stuck with me as I realized that most people have ab clue what’s on the menu for a gluten- free vegan! I certainly wouldn’t have, in years past! I want to show people the amazing food cruelty-free food they can enjoy, regardless of other dietary restrictions like celiac disease. 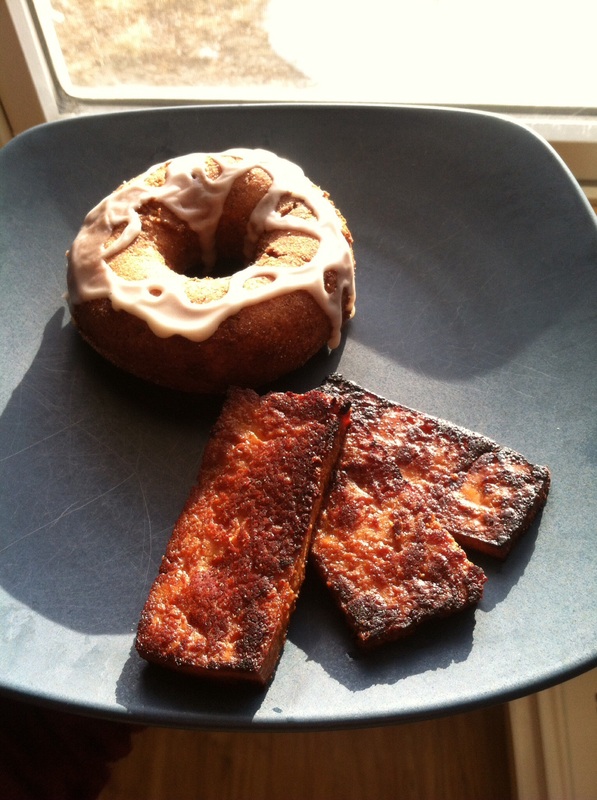 So without further ado, I present my first crazy-indulgent absolutely delicious meal: tofu “bacon” and donuts (hey, no one says every meal has to be healthy). There it is, my overly indulgent Sunday morning breakfast. It was the perfect accompaniment to my morning cup of coffee with soy milk. The donuts were very dense and cake-like; the recipe is from the wonderful Allyson Kramer’s book “Great Gluten-Free Vegan Eats” which I highly recommend to ANYONE with celiac disease, whether they are vegan or not! Her sweet recipes, this one in particular, are so indulgent and rich that you’ll never miss the gluten or animal products. The tofu bacon recipe comes from Pink Troll Kitchen (her Smoky Tofu Bacon recipe) -and I swear, it tastes like bacon. I found I had to cook it slightly longer than she did, but the end result was fabulous. Even our resident omnivore (a dear friend who spends many a meal at our table) was thoroughly impressed by the bacon-y flavor shining through – here’s the link to her recipe! .